LONDON — Across Europe, stodgy career bureaucrats have been pushed aside in favor of a new guard of young, fresh-faced politicians. In the last year alone, France, Ireland, Estonia — and now Austria, where the 31-year-old Sebastian Kurz is poised to take power — have elected leaders under the age of 40. Meanwhile, Belgium, Greece, Malta and Luxembourg have in the last four years elected heads under the age of 45. 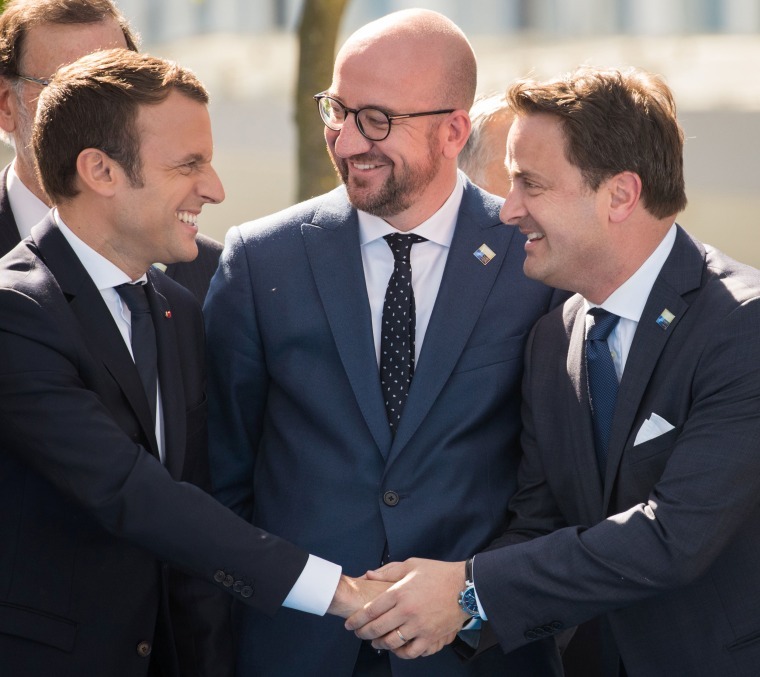 Growing unhappiness with establishment politicians is driving the wave of youthful energy across the continent, said Susi Dennison, senior policy fellow at the European Council on Foreign Relations think tank. More than youth alone, these leaders offer their countries a renewed sense of vitality and excitement on a continent facing its share of challenges — from increased immigration from Africa and the Middle East, to unemployment. Austria’s Kurz, whose party garnered the most votes in Sunday’s election, is set to become the world's youngest leader. From the outside, the millennial politician born in 1986 is a breath of fresh air. In one of Europe’s most conservative countries, he re-energized his party’s staid image by changing its color from black to turquoise, frequently goes without a tie and, like many millennials, reportedly works from a standing desk. But while a crop of new and exclusively male faces now populate the top of European officialdom, the institutions many of them lead are the same as ever. Kurz, for example, leads one of Austria’s oldest parties and ran on a platform featuring right-leaning policies. It’s precisely this mix of youth and tradition that may make these new leaders palatable to the electorate, analysts say. The leaders elected this year are far from inexperienced and were well known by the electorate before their campaigns. Kurz in 2013 became Austria's youngest-ever foreign minister and hosted negotiations on the 2015 Iran nuclear deal. Ireland’s Prime Minister Leo Varadkar, who is currently Europe’s youngest leader, as well as Emanuel Macron, France’s youngest-ever president elected in June at the age of 39, also held high ministerial positions before leading their political parties. In a sign of the changing times, Varadkar’s election marked several significant firsts for the predominantly Roman Catholic country — he’s the country's first openly gay prime minister, the youngest to hold the office, and the first Irish leader of Indian descent. “The rise of social media has changed the dynamics of politics,” said Stefan Lehne, a visiting scholar at the think tank Carnegie Europe, who lives in Vienna. The relative youth of Europe’s new leaders stand in direct contrast to the continent’s aging population, where the median age is 42.6 — more than four years older than the U.S. But it signifies a renewed interest in, and enthusiasm for, politics. “The emergence of youthful figures in positions of power gives hope to young Europeans who may have seen politics as a ‘no-go zone,’” said Michael Cottakis, director of the 1989 Generation Initiative at the London School of Economics university, which aims to involve young people in politics. It still remains to be seen how far the policies of young leaders will actually represent a break from the past, he said. Defying the trend for young leaders are Germany and the U.K., where recent elections kept the old guard in power. There are however, questions on how long that will last. Both Germany’s Chancellor Angela Merkel and the U.K.’s Theresa May were re-elected with much smaller majorities than expected. On Monday, Germany’s most popular paper, the Bild, asked why they don’t have a young leader like Kurz. Meanwhile, May, whose leadership has looked shaky since June’s election, is beset by constant rumors of a putsch in her Conservative party. One of her potential successors is 38-year-old Ruth Davidson, the leader of the Conservatives in Scotland, who is engaged to a woman. Despite what seems to be a growing trend for younger leaders, older politicians are still very much involved in governing and setting the agenda. “In Austria and elsewhere, powerful people — mostly men — in the party remain powerful,” said Lehne.